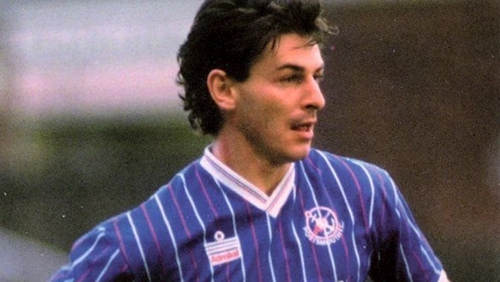 Tributes have been paid to former Republic of Ireland international Mick Kennedy following his death at the age of 57. Tough-tackling midfielder Kennedy made more than 500 league appearances for Halifax, Huddersfield, Middlesbrough, Portsmouth, Bradford, Leicester, Luton, Stoke, Chesterfield and Wigan. He won two senior caps for Ireland having represented the Under-21s on four occasions. Portsmouth, whose then manager Alan Ball paid £100,000 for Kennedy during the summer of 1984 and saw him help the club win promotion to the first division three years later, offered their condolences to his family. A statement on portsmouthfc.co.uk read: "Pompey are mourning the death of Mick Kennedy, who has passed away at the age of 57. Former Pompey team-mate Mick Quinn added on Twitter: "Just found out my friend and former team-mate Mick Kennedy passed away yesterday. Mick and his family very kindly let me stay with them when I first joined @officialpompey.